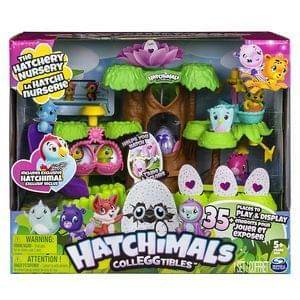 Where can I buy Hatchimals Colleggtibles Hatchery Nursery? Difficult to find, this toyset is a Christmas must-have from Spin Master. Look after and hatch 35 Hatchimals. Play with them alongside a spinning crib, swings, slides and more. Here, our Hatchimals Colleggtibles stock checker tells you where to find stock. It notifies you automatically by email. You just might be able to score a Hatchimals Colleggtibles Hatchery Nursery here! The site says: This item can be added to your bag but is temporarily out of stock. This item will be dispatched by September 23rd 2017.
thanks for the heads up!!! just pre ordered one with 20 percent off and free delivery !!!! been searching for over a week !!!! Both JD Williams and Fashion World offer a 20% discount on first orders too! Monday 23rd October - Hatchimals Colleggtibles Hatchery Nursery is IN STOCK at Toys R Us for Home Delivery. BE QUICK! Hatchimals Colleggtibles Hatchery Nursery is in stock at some Argos stores today! You can pre-order right now at Amazon for £29.99! They'll hgave stock next week. Get your order in quick! Just spotted some in stock at Smyths Toys! I think the Smyths Toys URL for ther Hatchery Nursery on Stockchecker might be broken. any other websites offers this toy for more than 40£! This is the Hatchimal Colleggtibles Nursery. A pretend play forest where you can hatch up to 35 Hatchimals with the Hatching Tree. You place the egg inside a magical flower, right inside the tree trunk. Crank the bright yellow handle round and the flower rises up the trunk. When at the top of the Hatching Tree, purple leaves open and the Hatchimal egg will be cracked open!